oh, I wish I could take a course on dictionaries. Why don’t they have that at my school? :-)That dress is fun. I’m a ridiculously devoted lover of gingham, and it’s a perfect pattern for that. Tulle is everywhere lately, under dress hems, peeking out. How bout if the ruffle were less full, but with some tulle peeking out? Ohhhhh.This would also be kickass in seersucker. Maybe gray seersucker with pink piping or a pink tulle petticoat? I love that dress but I would make it in BLACK eyelet. (Even if I had to buy white and dye it myself!) I hate sewing ruffles..all that gathering, but it would be worth it. I see this pattern in a navy blue. It will tone down the ruffles to just the right level without being too severe. Fantastic dress! I do love ruffles. Can’t wait to see what you make with it. I must say that a print would fight too much with the design of this dress – solid colors are the way to go (but with, you know, contrast piping or belt, of course). And Erin, we will miss our daily dose of dresses, but by all means, VACATE. We will be even fonder of you when you return! I very much enjoy your blog, and that pattern is amazing. Thank you for posting the link to the ebay store. I thought I’d return the favor. 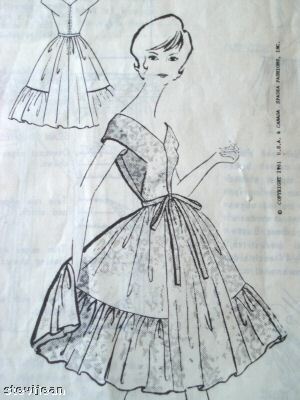 http://vintagesewing.info/index.htmlis an excellent website. Also http://www.hedgehoghandworks.com/index.shtml is a very good source for books. Wonderful dress! Guess I missed the prohibition on patterns: I’m glad you violated it for this one. I’d heard of her, but didn’t know anything about her. Now I’m intrigued. I have some black eyelet, purchased at Stone Mtn. & Dtr. in Berkeley, but not enough for that skirt! A friend always gathers by hand; I tho’t she was nuts, until I tried it, and it’s the way to go. It makes for very nice, even gathers. The control is the thing. I encourage you to keep the vee in the back.Do enjoy your vacation: we will miss you, but that’s the point! It’s a little to apronish for my tastes. I’d feel like I should be holding a dry martini on a small silver serving tray waiting for my husband to walk through the door at the end of a hard day’s work at the office. We’d miss you, but vacate, baby, vacate! I know where you can get black/dark grey seersucker if you’re serious about it! I’m not listing it cause then it will be all gone before I can buy some this weekend but email me if you want it! Erin I think that dress is very lovely. Personally, I think it would be a mistake to make it in black. It’s a summery dress, and a fun dress, a dress to wear and feel playful. In my opinion it is asking for a vibrant and bright colour. Whichever colour suits you, but a fun, exciting colour. Erin…love the website…it has been a bit of beauty in my life, as well as encouraging me in my sewing experiments…I now realize how much I need a dress form. Love this dress…think the vee at the back makes the dress more grown up than it might be without it. How about black and white gingham with an outrageously bright colour for the belt? However, I do like the thought of it in eyelet…Thanks. This is surprisingly ruffly for Mollie Parnis. I’m a huge fan of her 70s Ultrasuede dresses, which are quite streamlined, but then Ultrasuede lends itself to that look. Going through withdrawal here! I hope you come back full of things you need to get onto the blog, because I really miss you. Hope you had a nice, relaxing, vacation. I just wanted to say that I love when you feature vintage patterns… that was the whole reason I got hooked to Dressaday in the first place. Please dont do away with them. Maybe you can pick a day a week that is pattern day :)Just a thought… enjoy your vacation! I swear I’ve seen this dress, made in blue and white, before. Have you already made it and are walking around town with it on? Thanks so much for the pattern. I had one similarly made from a shop on http://www.gatheringguide.com a few years ago for my sister’s wedding. I don’t remember the shop, I’ll try to find it.